Although water alone can remove dirt from concrete, cleaning chemicals often are needed to remove specific stains. Many contractors recommend spraying the stain with the recommended chemical and letting it sit for about 15 minutes before power-washing the area. Removal of oil from parking lots, drive-throughs, and other concrete pavements is the most common concrete power-washing application. In addition to hot water, an alkaline degreaser will greatly increase removal rates of oil and grease. Hot water lifts the oil from the concrete, and the degreaser emulsifies the oil, allowing it to be flushed from the surface. Some contractors use at least a little degreaser for most jobs, even to remove dirt, which can be somewhat oily. According to Hinckley, alkaline cleaners are also the preferred chemical for cleaning soot from concrete. 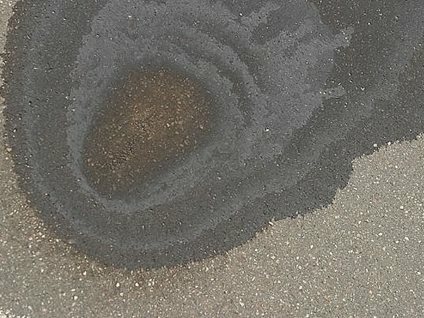 Concrete with oil and grease stains. Removal of oil from parking lots, drive-throughs, and other concrete pavements is the most common concrete power-washing application. In addition to hot water, an alkaline degreaser will greatly increase removal rates of oil and grease. Hot water lifts the oil from the concrete, and the degreaser emulsifies the oil, allowing it to be flushed from the surface. Some contractors use at least a little degreaser for most jobs, even to remove dirt, which can be somewhat oily. According to Hinckley, alkaline cleaners are also the preferred chemical for cleaning soot from concrete. 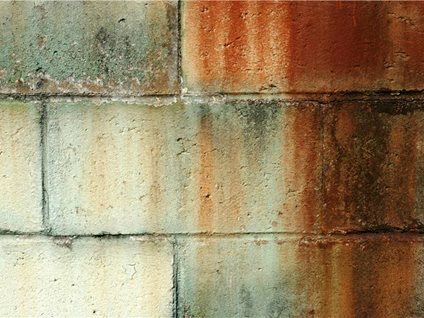 Rust Heavy rust stains can penetrate deeply into concrete, so they can be tough to remove completely. Cleaners containing oxalic acid are most effective. Graffiti can be very difficult to remove, depending on the type of paint used. Several proprietary chemical strippers are available, many of which contain a citrus-based solvent, methylene chloride, or potassium hydroxide. Citrus-based solvents are the least aggressive and may not work on certain paints, but they are the safest to use and often have less-stringent disposal requirements. For best results, allow products containing potassium hydroxide to soak into the concrete surface for several hours before power washing. These products also require a subsequent application of an acid neutralizer. 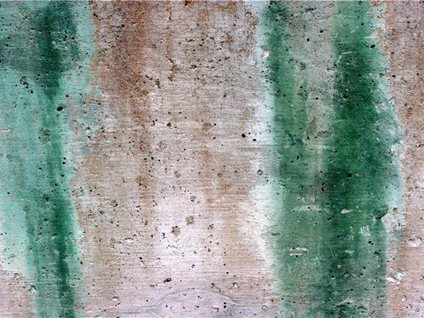 Heavy rust stains can penetrate deeply into concrete, so they can be tough to remove completely. Cleaners containing oxalic acid are most effective. Graffiti also can be removed by a special attachment that includes a tungsten-carbide nozzle that meters sand into the water stream before it exits the nozzle. But the sand will etch the concrete, which may not be desirable. In recent years, softer sodium bicarbonate abrasives have been used with power washers to remove graffiti from concrete (see Concrete Construction, February 1999, p. 87). Acid-Free Bio-Degradable For general cleaning of interior and exterior applications. Heavy Duty Degreaser Bio-degradable encapsulating degreaser & prep. Kemiko Neutra Clean Low VOC All Purpose Cleaner. Leed compliant.